"Stoplight" in Japanese is "Sutoppuraito". Say that out loud and it becomes awesome! At that speed, it takes us forever to get out of Tokyo. Once outside of the city limits, we pull into a strip mall to grab some lunch and nurse my aching back and wrists. Neda doesn't seem to have any problems with the seating position. 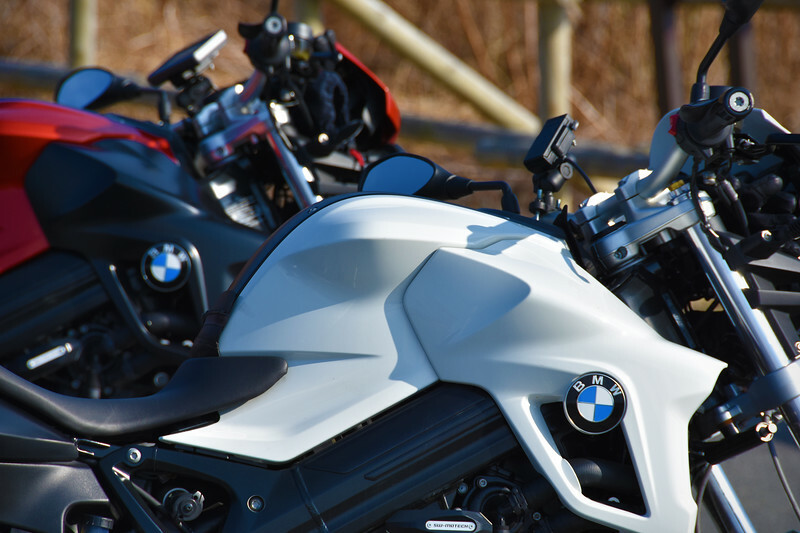 She took to the F800R like a natural. We park in the lot with all the other cars but an attendent approaches us and starts talking to me in Japanese. I get this alot in Asian countries, it's because I look local. However, in Japan, Japanese people keep talking to me in Japanese even *after* we've both established I don't speak or understand Japanese. But Why?!? They just keep talking at me, as if I will magically learn the language in the next 30 seconds or so. And not a few people, almost all of them do that. It's so strange... It's like they are telling me, "It's incomprehensible that you look Japanese, but don't speak Japanese!" wanted us to park here, off to the side. Cool! Special parking! Just like there's a Gringo Trail in Latin America - which is that route where all the tourists travel on, I get the feeling that there's a Gaijin Trail in Japan, which is basically all the major cities on the Japan Rail system: Tokyo, Osaka, Kyoto... Anywhere outside the Gaijin Trail, there's no need for any locals to speak English anymore. And none of the signage needs to be in English either! Well, we're off the Gaijin Trail now. The ordering system is totally in Japanese, no English whatsoever! AHHH! Once you've ordered, the food shoots out on this conveyer belt and is routed to your table. Cool beans. Finally, we give up and flag a woman from behind the counter over to help us, but she doesn't speak any English either. She demonstrates to us which buttons to press to order and pay, which is good enough to get us by. Success! Neda did order the "Ladies Lunch" in the end! This was not as frustrating as it sounds. 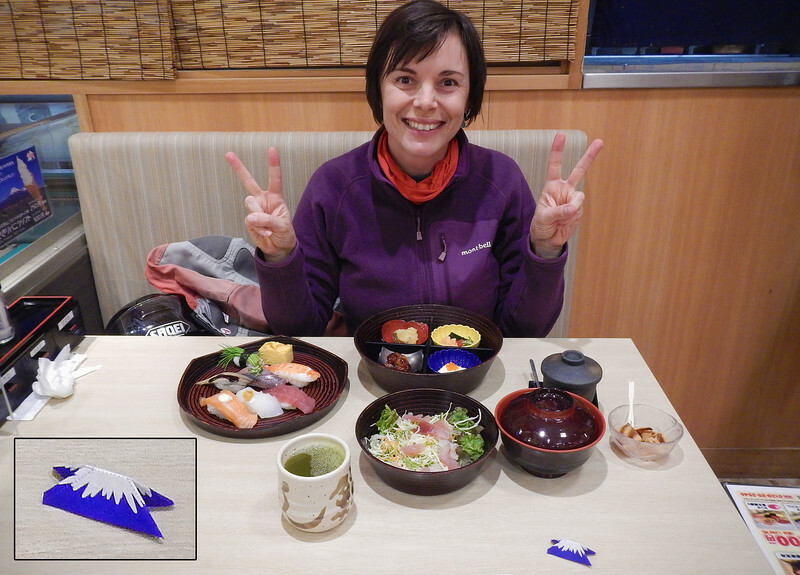 We're so enamoured with Japanese culture that our floundering in this total immersion was actually fun! We giggled with delight at just about everything from the button-mashing, to Ladies Lunch to the way the trays popped off of the conveyer belt. One small thing I liked is the wrapper that the chopsticks come wrapped in. We've learned that you can make a chopstick rest from the wrapper if you fold it right. In this restaurant, they've designed the chopstick wrapper so when you fold it, it ends up looking like Mount Fuji! See the picture above. Mount Fuji is the national symbol for Japan and has important cultural and spiritual significance in the country. But more about that later. We hit the road with full tanks and full stomachs. As always, we don't have a concrete plan, but the general idea is to keep on heading south, towards the warmer islands, because it's so cold up here in the north. We are thinking that we may be able to see some Cherry Blossoms bloom sooner since it starts earlier in the south. And then follow the blooming season as it moves northwards throughout April. On the highway, I see familiar names on the road signs. Yokohama flashes by. Isn't that where they make the tires? 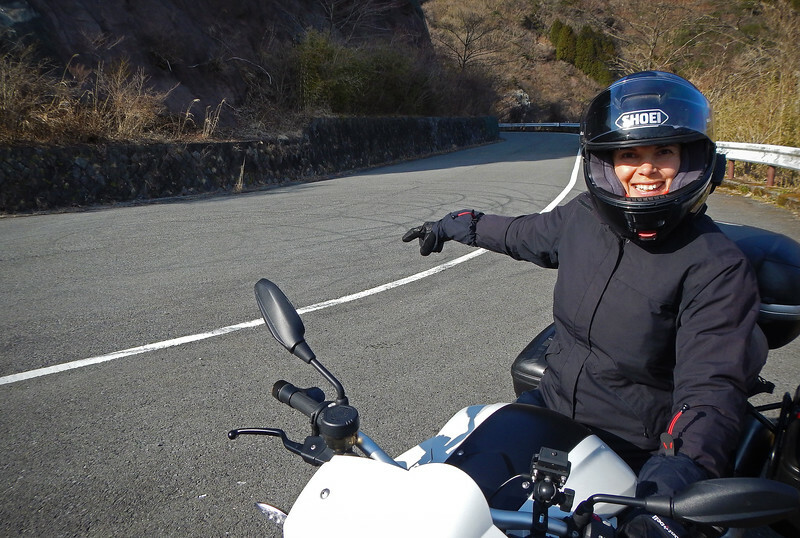 After a couple of hours heading SW at glorious triple digit speeds, we exit around Mount Hakone, just north of the Izu Peninsula. I read that there are some great twisty roads in the area. 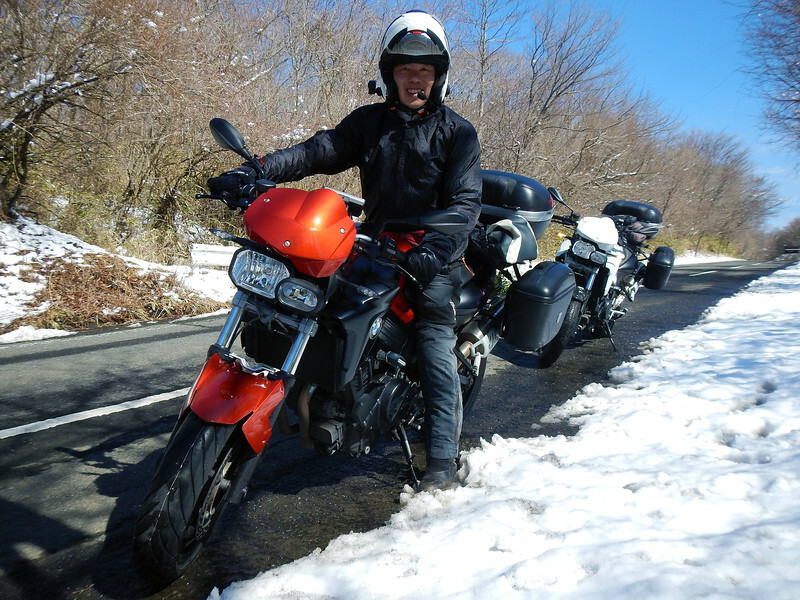 We tiptoe through wet and slushy roads, unable to apply our sportybikes to their full capabilities. If you've ever seen the Fast and Furious movie, Tokyo Drift, you'll know that the car guys all go up into the mountains at night, backing in their souped up Skylines and Hachi-Rokus at every turn on the twisty roads. 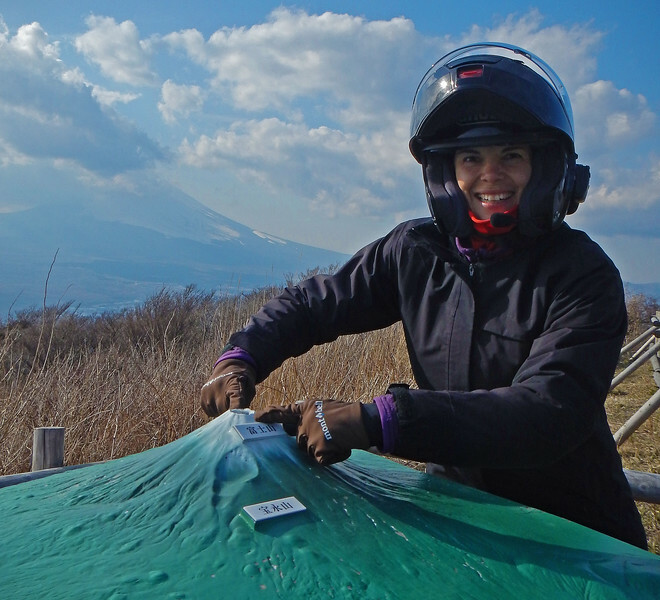 On Mikuni Pass, the evidence is there: you can see black rubber marks behind Neda's helmet in the picture. 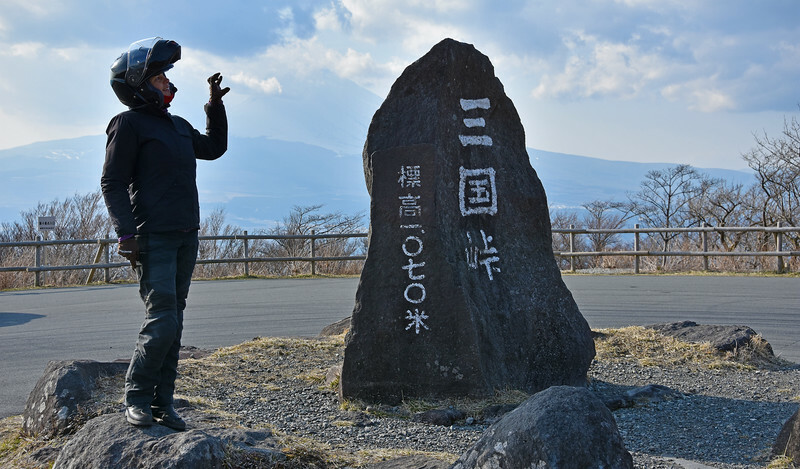 In front of the scenic lookout, Neda points to where someone did donuts. LOL! There's a little diorama showing where Mount Fuji is. It's right behind you, Neda! Ah, Mount Fuji. Subject of countless poems and paintings. The spiritual and geographic symbol of Japan, it is the largest mountain in the country (it's actually classed as an active volcano! ), perpetually capped in snow all year round and is perfectly symmetrical from all sides. The main religion, Shintō, has the belief that gods or deities exist in nature, residing in trees, lakes, the rain and the wind. No wonder the Japanese have such reverence for the mighty Fuji. If the weather is clear, you can see Fuji from Tokyo. If that happens, the Japanese believe that indeed, it will be a good day. 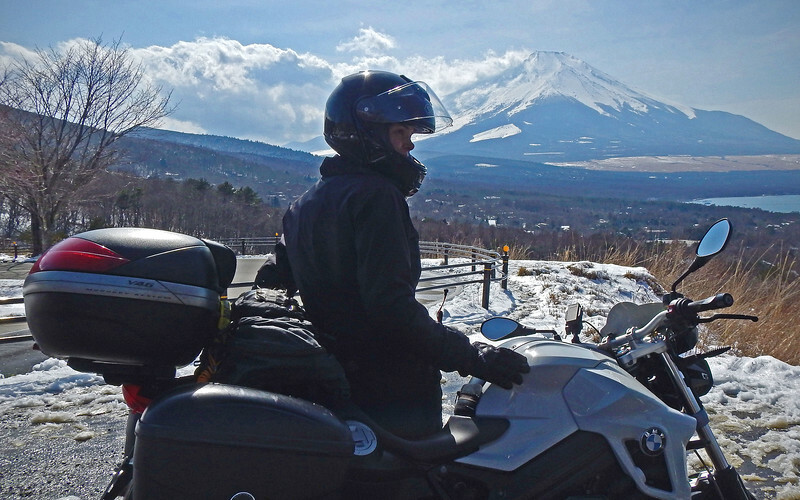 Today for us, clouds shroud Mount Fuji, but it doesn't dull our excitement about riding motorcycles in Japan! Despite the cold weather, our Uniqlo HEATTECH underwear is doing an adequate job. The Izu Skyline! 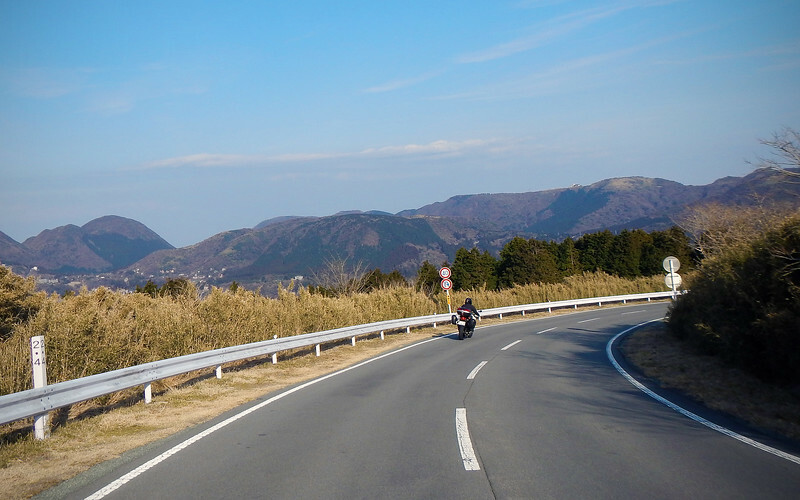 One of the most popular motorcycle roads in the area, some argue that it's the best in the country! 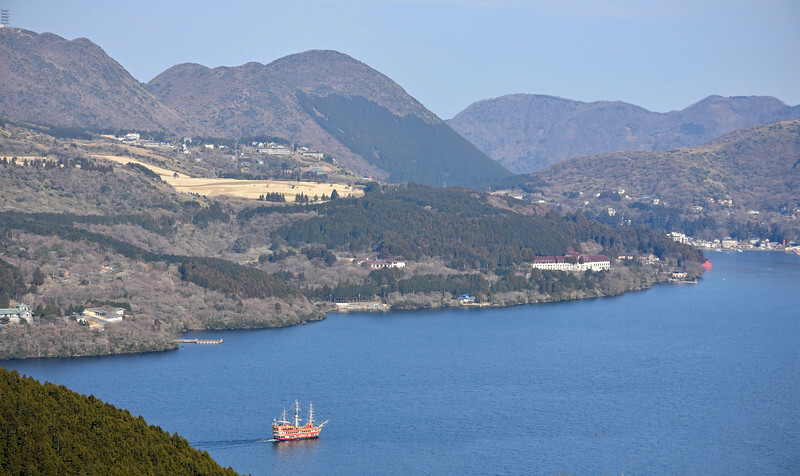 The Izu Skyline runs along the eastern side of the peninsula through some very mountainous terrain. 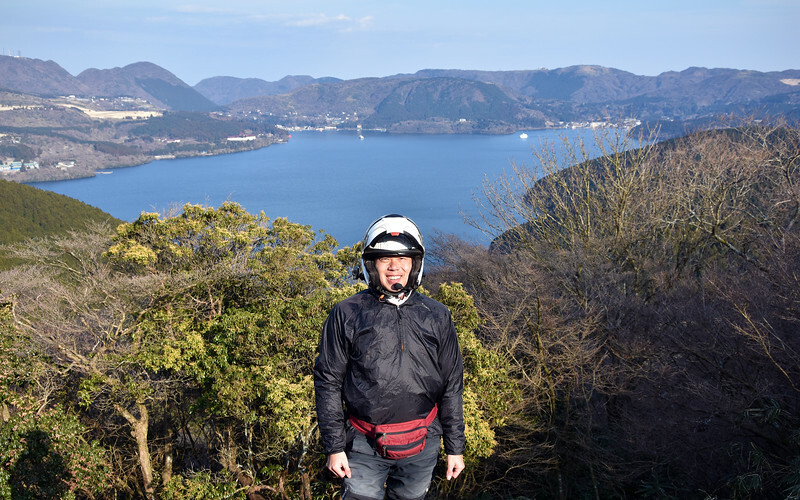 It's very twisty, as if designed by a motorcycle rider, and there are many scenic pullout stops to view the coastline and the Sagami-nada Sea below. Of course, it's a toll road. You gotta pay to play. It's divided up into sections and you pay to ride each section. A popular thing to do is only pay for one toll and turn around before you hit the next tollbooth so you can ride your favorite section over and over again for the price of one toll. You don't have to be able to read Japanese to get the dorifto. Ride safe, it says. Too many accidents here. The third poster says you win a prize if you can maintain a minimum speed of 110 km/h in the corners... what? Because it's so early in the season, the days are still very short. We'll have to zoom through the road without stopping otherwise we'll be riding in the dark very soon. Sorry, the light wasn't good enough for pictures and we didn't stop at any of the scenic pullouts. 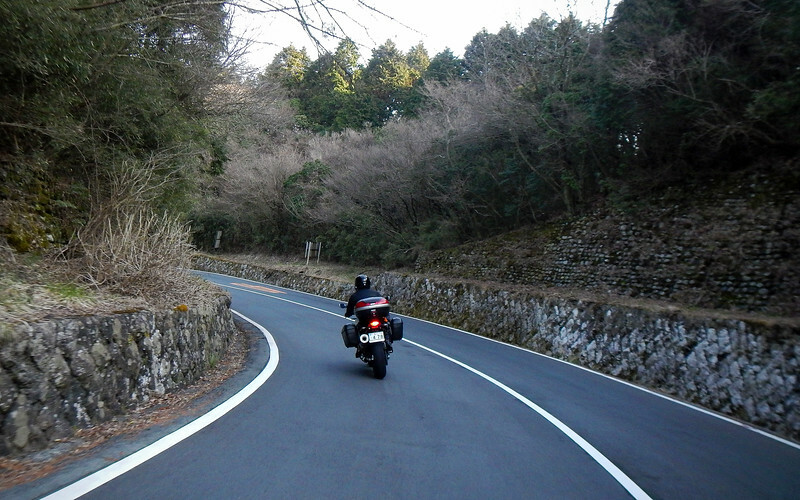 With dry roads ahead of us, we attack the Izu Skyline with zest, getting a good feel for the rhythm of the curves on the road. In the absence of traffic and other obstacles, you can really get into the mindset of the road designers: what speed the road was designed to take comfortably (and uncomfortably! 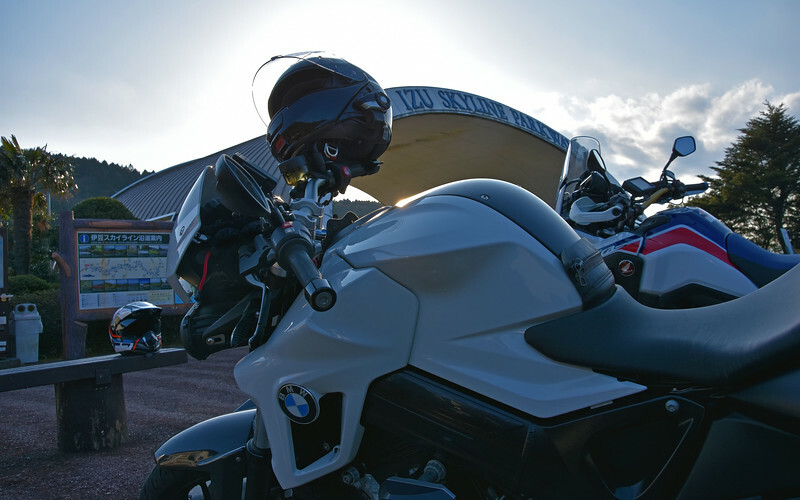 ), how far you can safely push the bike in the turns, etc. For the first time today, I'm glad we're on these sportybikes instead of our staid GSes. The aggresive seating position feels much more natural as the digital speedometer steadily ticks higher, allowing you to lean more confidently into the corners. The 800cc engine is the same one as Neda's F650GS, but it's tuned a bit better for the street. Good power and feels more revvier than my R1200GS. Oh, I've missed sportbikes so much! And the road! So nice and wide, and the pavement is in excellent condition. After riding for so long in developing countries, it's such a relief not having to worry about potholes or cows lurking around the next corner! WHEEEEE! 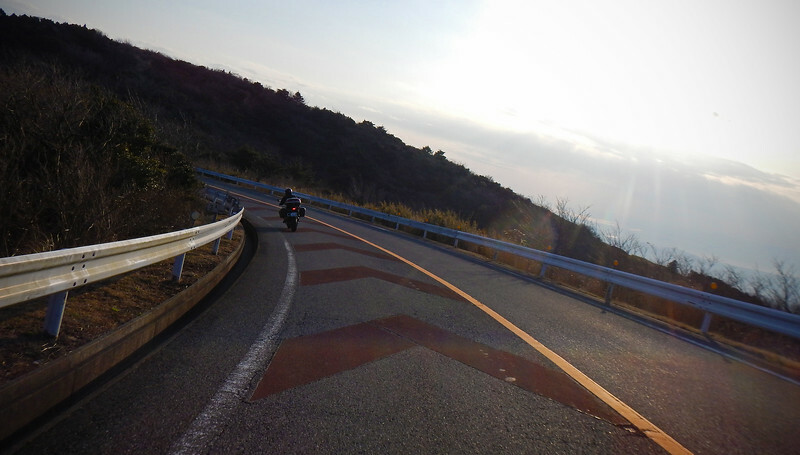 The Izu Skyline is about 40km long, I stop for a quick snap on the bikes and then we're off again! 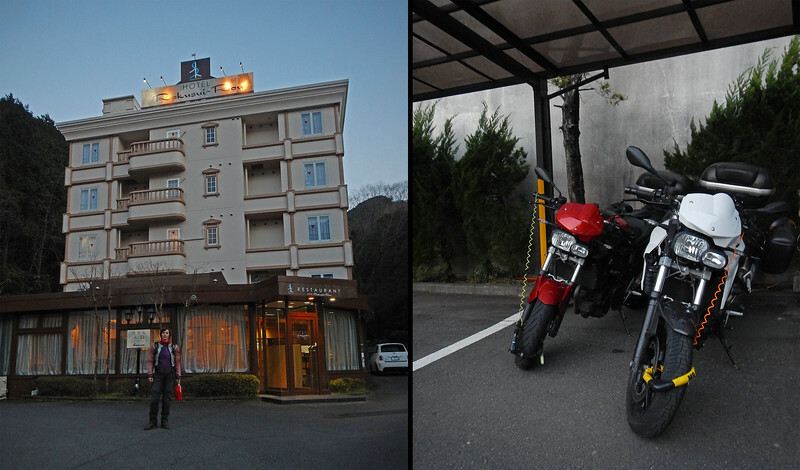 We made it to the end of the Skyline just as the sun disappeared below the Izu mountain range to the west of us. 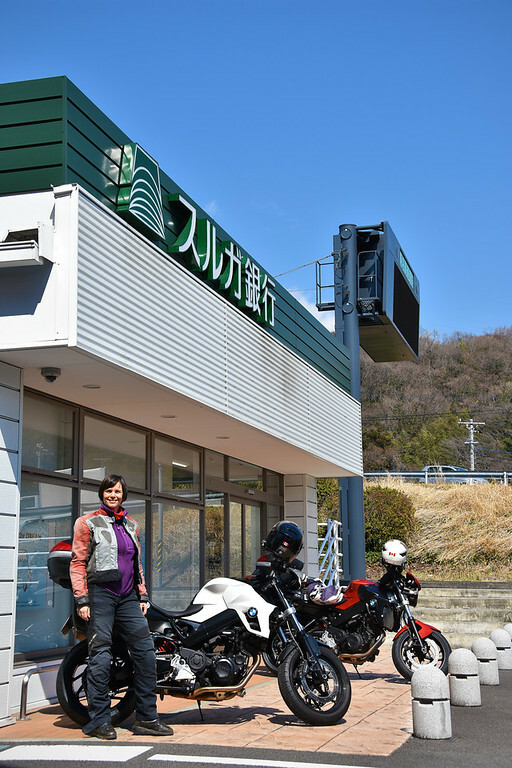 Despite the interminably slow start trying to escape the gridlock of Tokyo, our first riding day was most excellent once we made it out to the countryside! Super-nice accomodations and the price is not that bad - about $50. Prices in Japan are a lot cheaper than what I thought they'd be! Tomorrow we head further south, in search of warmer weather and Cherry Blossoms! Please keep it coming !! A "wrap up " somewhere when their travels ended ? I keep checking back here and on their website, also hoping to hear what they are up to. I’ve been reading their travels longer than any other trip report. I to have been reading this for a few years now and looked forward to getting a email telling me there was an update. Sad it has ended but they had a GREAT adventure and I thank them for sharing it with all of us! I also hope they reconsider the idea of doing it in book form.